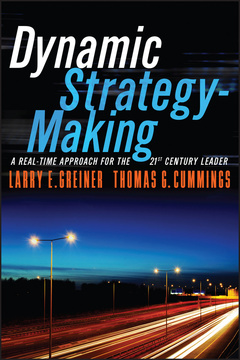 Dynamic Strategy-Making: A Real-Time Approach for the 21st Century Leader Greiner Larry E., Cummings Thomas G.
Auteurs : Greiner Larry E., Cummings Thomas G.
"An astonishingly timely, hopeful, and important book that recasts and freshly imagines strategy–making and integrates theory with practice in the field of strategic management. A must–read for all those who want to learn more about the future of strategy practice and become more skillful at it." "This is one of the most valuable resources ever created for strategists and leaders in organizations. It uniquely combines concepts of leadership and organization with strategy content and implementation in a pragmatic and integrated approach that makes tremendous sense for our times. With concrete cases, it provides a clear road map for those who want and need to do a better job of formulating and implementing strategy." "The authors correctly focus on the new dynamic of 24/7 competition and change and the need for organizations to be fast, fluid, and flexible. It is a must–read for managers of tomorrow and offers a number of practical insights and lessons on how to proceed with strategy execution that can be readily adopted in any organization. It is a call to action that few can afford to ignore."